This workshop is inspired by the spirit of the Japanese Mingei movement in the early 20th century, when ordinary people and craftsmen developed techniques to recycle fabrics in order to make new cloths. In this experimental workshop, we will recycle and rework two typical elements of the male wardrobe: the shirt and the jacket. The aim will be to reshape, shift and hybridize these codified and standardized elements into innovative new garment forms. We will play with processes of deconstruction and reconstruction, and explore transitioning between three-dimensional and two-dimensional forms. 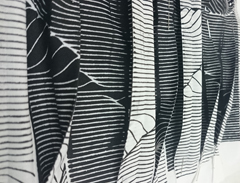 Creating relationships between surface and pattern, and texture and rhythms, we will use diverse sewing skills and the repetition of gestures along with simple methods for applying colour and graphic effects to cloth (e.g. screenprinting). Working with composition, scale, distortion, warping, mirroring and repetition we will create new patterns. In so doing, we will transform and digest industrial fashion products into new, original and one-of-a-kind pieces. Based in Paris, Aurore Thibout defines her practice in terms of both art and fashion. Her work blends various media and approaches. She studied fashion design in Paris at the Duperre Ecole Superieure des Arts Appliques and the Ecole Nationale Superieure des Arts Decoratifs. Awards include The Public Grand Prix Award Hyeres Fashion Festival 2006, The Creation Grand Prix Award from the City of Paris 2013, Villa Kujoyama Art Residency Kyoto 2015. Aurore has worked in costume design in Paris for theatre and dance companies since 2004, and for the National Opera Bastille in 2016. Her work in fashion has been exhibited at venues such as Paris Fashion week, Roma FashionWeek, Designer's Days, Paris, Nuit Blanche, Kyoto, The workshop Residence, San Francisco, and Handwerk and Design, Berlin. A former designer with Martin Margiela, she regularly teaches workshops and gives lectures in France, US and Asia. Inspired by Memory and Traces, she has developed her own range of unique designs, the "Memory Clothes" series; a collection of one of a kind pieces at the intersection of clothes and textile art. Using up-cycling and rethinking traditional techniques with a contemporary approach, she develops collaborations with highly skilled artisans and artists in Taiwan and Japan for both exhibition and performance. Her exclusive clothing collection is based on natural dyes and slow made process. It is currently distributed in select high-end boutiques in Japan (Osaka, Kobe, Tokyo, Yokohama) and USA (San Francisco). 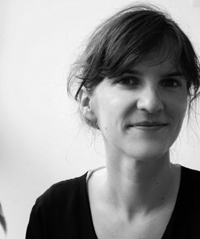 Laurence Teillet is a French multi-disciplinary designer who works and lives in London with her partner and 3 children. She studied Fashion design at Duperre, Ecole Superieure des Arts Appliques in Paris, and Textile design in London where she developed a Design Manifesto to re-use second hand textiles for her MA at Central Saint Martins (UAL). Since then, she has continued to follow her philosophy of designing with a conscience; being aware of her impact in today's society by re-using waste materials to experiment, refine and redevelop new types of fabrics and possibilities for clothing. Laurence's work includes a range of re-used textile designs created through inventive printing techniques for Atom Design Studio in London. The Garment Party Happening, her conceptual and experimental work-in-progress about how to wear and use clothes in different ways, led to creative collaborations with Fashion Professionals and Art Institutions such as Selfridges in London, Upside down - Inside out Exhibition in Copenhagen, ELLE Magazine & Licence and Edelkoort Studio in Paris. In 1999, Laurence was appointed Head Fashion Designer for the Artisanal Collection at Maison Martin Margiela in Paris where she was responsible of sourcing and reworking vintage clothing and accessories, combining artistic and conceptual designs with traditional and innovative techniques. Back in London in 2003, she worked at Jessica Ogden Studio on the development and production of handmade limited editions and one off pieces; sourcing materials and antique fabrics, using diverse craft embellishment skills, dyeing, printing, quilting, patchworks and embroidery... In 2005, Laurence co-founded Elemental, a vintage furniture boutique in East London, also curating selected designer-makers specialising in up-cycled and handmade products. She is currently the Art Director working on branding, visual identity and product sourcing. Since 2009, she has been leading experimental master classes in art schools and museums in France and USA, to transmit her experience, share her creativity and the importance of responsible design in fashion and textiles. Aurore Thibout is a textile and fashion designer and artist living in Paris, France. In her work, she captures the passage of time and explores the concept of memory through creating limited editions and unique pieces. 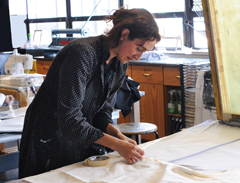 Melding tradition and innovation, her creative process begins with selecting materials, and involves recycling antique fabrics and using natural dyes. Her collections reflect cultural heritage from past centuries through to the present day, and she regularly develops work through a process of collaboration. In this talk, she will discuss the challenges in creating work through a dialogue between various disciplines, artists and craftspeople from all over the world, crossing borders and being inspired by difference to nourish her multi-faceted approach. Working with a process of conscious creation and reflecting on the legacy for future generations, she will focus on the potential represented by research-creation projects that incorpo- rate and reinvent techniques to create a new approach, one that is respectful of nature and human well- being as a whole.